Drawing 3 has a design similar to drawing 1, with a rectangular Court surrounded by offices. The Barracks are shown on the north side of the court. An armoury is included in pencil within the semicircular-ended office to the north-east of the proposed court. In June 1803 the Building Committee decided to build a Barracks in the new wing but to keep the building separate from the rest of the premises by a strong door. A plan was approved shortly thereafter. 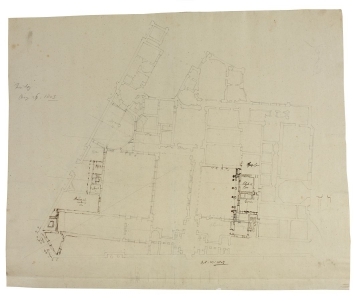 Drawing 3 shows a preliminary design for rearranging the Governor's Office and the Clerk of Committee Office in relation to the design for the Waiting Room Court, which was eventually executed in 1807 (scheme 3:13).